The 1998 Toyota Corolla was a major advance over past models, with a new engine that provided good power with excellent economy, a comfortable interior, and Toyota's usual reliability, but at the cost of interior space and, compared with some competitors, handling, air conditioning capacity, and acceleration. The current generation is evolutionary rather than revolutionary, fixing deficits without cutting back on Toyota strengths. First, consider the prior Corolla's competitive disadvantages. Handling on our Corolla S seems better than on our prior-generation Corolla LE, with the comfortable, well-cushioned ride largely preserved. The less-than-idea air conditioning has been beefed up, so it seems to easily outperform the Civic. 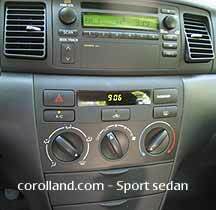 (The air seems to have been improved in 2004 models over the 2002 and 2003 versions). Interior space has been expanded so that it is now a true four-passenger car, with room for five in a pinch. The back seat still is not quite as spacious as that of the Neon, but it is certainly acceptable and an improvement over the prior generation. Acceleration is better, and the automatic feels very peppy, yet gas mileage is surprisingly good - 29 city, 38 highway, with an automatic transmission. That equals the Neon's gas mileage with a manual. What's more, it does it with a remarkably clean-burning engine which, unlike the Civic, feels strong from idle on up. Even minor annoyances of the past Corolla seem to have been attended to. The flimsy-feeling door handles, for example, have been replaced by Volvo-style "pull and it opens" handles which are easier for people with larger fingers or gloves on. On the darker side, you still have to empty out the entire trunk to get to the spare tire. The bland-Japanese exterior has been updated with a more European-bulbous look, with the front end getting the Lexus treatment and the sides looking more Volkswagen than Toyota. The rear has clever tail-lights with integrated amber turn signals for safety. The interior of our Sport (S) model is clean and simple, with many ergonomic features and a quality feel absent from the Ford Focus. The whiteface gauges are cleverly backlit at night with a bluish-white, even backlighting (fluourescent?) which is adjustable so night vision is not lost. The numbers are large and easy to read, and the overall effect sporty without being distracting. The speedometer goes up to 110 mph, a reasonable number - the Corolla can almost certainly reach it, and few people are likely to ever exceed it. This number also keeps the magical 60 mph near the top of the gauge, so that the tachometer's redline and the legal speed limit are in roughly the same spot, making it easier to process the information. A smaller temperature and gas level gauge are off to the right, with the fuel door shown by an arrow (so you pull up on the correct side of the pump). The switches and knobs all have a solid feel, and again are large enough to be operated by people with gloves. A separate stalk contains the cruise control, with up adding speed, down reducing it, and a pull cancelling the control for the moment. An on/off switch on the end of the stalk shuts it off entirely. We have found this to be the ideal setup. The climate control is easy to understand and use, without the confusion of the Neon - air conditioning is engaged with the press of a button, as is recirculation and the rear defroster. Underneath these oversized buttons are oversized knobs, for setting the vents, fan speed, and warmth. The side vents can be shut off, but the center vents cannot. All use old fashioned rectangular outlets which can be easily adjusted and, unlike many new cars, do not aim right at the driver's arms - a welcome change from the routine. Our Sport (S) model had a variety of places to put things. There were two primitive but deep cupholders, wtih a slot between for holding sunglasses, a pull tray on the left of the steering wheel, two compartments (one padded) in the center stack, a covered center console, and map pockets on both front seats. The past generation's primitive coin holder remains, and while the center console has a power outet, it does not have slots for CDs, tapes, or coins. On the lighter side, the glove compartment is large enough for more than the warranty and and manual - you can even store full size sheets of paper in it. 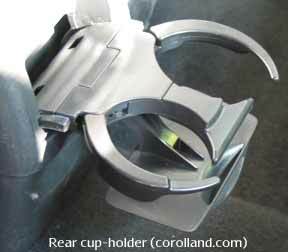 Rear passengers get a moderately flimsy cup holder which can probably last a long time with adult use, and is far enough from children to avoid the worst abuses (but since they probably won't be able to reach it, it's not very useful for them). One odd trait continued since the last model is the traditional Asian electric window lockout which, for reasons we may never understand, prevents the driver as well as the passengers from operating rear and passenger side windows. Headroom is surprisingly good, the seats very comfortable, legroom good unless you have tall people in both front and back on the same side. Child seat attachments are clearly marked and readily accessible, a welcome change from many current cars. The trunk is spacious for a compact car, and fold-down rear seats help when you need to carry especially large objects. The engine is eager and willing, though it runs out of power on sustained sprints, and feels better under part throttle. Acceleration is very quick from idle to 30 or 40 mph, but as with most modern cars, the shift to second robs quite a bit of power. It is still more than enough speed for most people, and you don't have to floor the pedal or rev up to 6,000 rpm to get it. This alone makes the Corolla a worthy alternative to the rev-happy but generally undistinguished Civic. Acceleration is certainly better in the higher rpm range but is not bad from idle. In city traffic, the Corolla feels stronger than it is thanks to well-designed pedal-to-fuel curves. Under part throttle we generally outran other cars from stops, because most people simply do not use all of their acceleration, so we feel safe saying that acceleration is more than enough for nearly all drivers. Under hard acceleration, the engine is not excessively noisy, but it does sound less like a muscle car and more like an economy car. We should also note that the automatic transmission tended to shift roughly under anything more than a very gentle acceleration, and that the gearshift had first and second gear positions, but no overdrive lockout (a minor issue). Handling is very good in general, though the Neon, Focus, and Civic will all outhandle the Corolla in situations most drivers never subject their cars to. Most drivers will find that the Corolla does everything they ask for it, willingly, and those who want more will find a simple change of tires will go a long way towards filling their needs. The Corolla feels nimble and quick, even if the tires tend to protest under stress. The Sport Sedan model comes with fog lights, color-keyed door handles, rear mudguards, front and rear spoilers (the rear spoiler serves no real function), power mirrors, locks, and windows, four-speaker CD, filtered air conditioner (a boon to those with allergies or small children), a different speedometer, chrome door handles and shift lever which add a sense of class, a leather wrapped wheel with tilt steer, rear defogger, tachometer, and remote trunk and gas releases. The price for this is $15,315, well above many competitors, but there are less expensive Corollas which are a better deal for most people. Our model, by the way, also had optional packages - weather guard ($70 and well worth it), cruise ($250), six-speaker stereo ($40 and again well worth the price), ABS ($300), alloy wheels (a bad deal at $825 - the tires are still Goodyear Integritys! ), and of course floor mats ($87). The total, with destination charge, ended up at $17,977, not too far from the absurdly fast Neon SRT-4 ($19,995) and well above the insanely discounted Neon, Cavalier, and Lancer. The Corolla distinguishes itself from these models with proven high reliability, excellent gas mileage, greater comfort, cleaner emissions, and a strong trade-in value. (In the case of the Ford Focus, you can add a refreshing absence of fires and recalls.) The Civic is priced in similar fashion, but in our opinion represents less of a value due to its lower level of creature comforts and lack of real advantage over the Corolla to anyone other than tuners, who would be better served with a Neon than a Civic anyway. The Corolla is built in Fremont, California and in Ontario, Canada. By comparison, the Dodge Neon is built in Michigan for a German-owned corporation (DaimlerChrysler AG); the Chevrolet Cavalier is built in the US, for an American-owned corporation; and the Ford Focus is built on an Asian design and is built in the US and Mexico; the Mitsubishi Lancer is built in the US; and the Honda Civic is built in the US and Canada, but by non-union workers. It is worth noting that Toyota has committed to expanding their US operations, while Ford is moving more to Mexico. Kevin Placido pointed out that the 2003-08 Corolla was faster than the 2001-02 partly because of its higher final drive ratio. Overall, the Toyota Corolla remains one of the best choices for commuter vehicles, providing the comfort of much larger, more expensive, and less environmentally friendly cars. As a corporation, Toyota has proven itself responsible to its employees, its customers, and the environment. The Corolla is more fun than in the past generation (at least in Sport trim), though the Neon is king of the class in terms of performance (according to Grassroots Motorsports). It's hard to find a better all-around vehicle. When the Neon came out, it was scrappy and cute, with performance that beat everyone in its price class. By 1996, the Neon had managed to garner a terrible reputation for reliability, thanks to many problems with models built in 1994, troublesome frameless windows, and head gasket failure through late 1997. The second generation addressed these problems, while adding space, comfort, and sophistication - while, if Grassroots Motorsports' tests and SCCA racing is any indication, still managing to neatly beat its peers in performance. Quality rose dramatically, and in some surveys beat the Honda Civic, though the "cute and scrappy" personality disappeared. Acceleration. In everyday use, while the Neon is faster, the Corolla feels just as peppy unless you charge ahead under full steam. Changes to the Neon's automatic make the 2004-2005 models much more competitive than earlier automatics. Gas mileage. The Corolla has a strong edge where gasoline is expensive or people care about pollution. Handling. Superior in the Neon. No loss of traction at all when accelerating from first, even when turning at the same time; no screeching of tires under hard and fast turns. The Neon is unfazed at all speeds (within its speed limiter) and under high winds, and has less screechy tires. Space. The Neon and Corolla are roughly the same dimensions inside, all factors considered. The Corolla has a little more trunk space. Lighting. Corolla has daytime running lights, Neon doesn't (in the US), you decide which is better. Neon continues its weird front-but-not-rear-power-windows system and awkward HVAC controls. Corolla has standard trunk and gas cap releases. Corolla makes you remove every single thing in the trunk to get at the spare tire, while Neon has a removable center area that lets you leave stuff all around the edges of the trunk while still changing a flat or getting to the jack. Corolla has more storage compartments, Neon has a very useful change tray. Corolla has nicer door handles. Neon automatically locks the doors at 18 mph (with power locks). As with all Chrysler products, the driver's door unlocks when you pull the handle. Neon lets you check computer fault codes without a reader. Neon stereo has sliders for bass and treble, easier than Corolla's push-and-turn. Ventilation. The Neon has more powerful air conditioning, at the cost of engine drag. Servicing. The Corolla makes you empty out the entire trunk to get to the spare tire (or the jack, which is very inconvenient to get or replace)...the Neon not only has a convenient center spare with its own cover, but also has instructions printed on the underside of that cover. Safety. Both have the second-generation airbags. Corolla can be ordered with side airbags. Quality. Corolla's more reliable than the Neon, but not by an incredible margin. Corolla remains tops. But Neon's much better than its reputation. Price. Neon's a bargain until you sell it...would you rather have the money now or later? You can get Neons starting at $10,000 thanks to insane rebates, courtesy of Chrysler's marketing ineptitude. Noise. Generally, the Corolla's engine is quiet and well-mannered, while the Neon's is more raucous. Corolla is quieter inside under most conditions. Automatic transmission. Past Neons had a three-speed automatic which hurt gas mileage and raised highway noise. 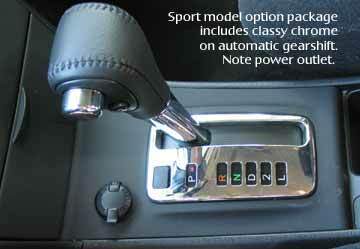 The first four-speed Neons were poorly tuned, so power and economy both suffered. 2004 Neons have overcome these problems and have a transmission which, to be honest, is smoother-shifting and more responsive than the Corolla. Overall. The Neon feels sportier and the Corolla feels more refined, though part of that is the sitting position and part is the quieter engine. The Corolla is superior if you want a nice, well-mannered, quiet car, strong gas mileage, or don't mind paying extra for a Toyota. The Neon is superior if you want a sporty car, or better performance, more room, or a considerably lower price tag. Both are far ahead of the other small cars on the market, and neither is a mistake to buy ... except that now you can’t get Neons, and the “replacement” (Caliber) is an SUV, not a car. The three cars were roughly equal in terms of interior space. In terms of actual performance, the Corolla neatly beats the base Civic, but is a little slower than the premium Civic EX. AAA found both Corolland and Civic to have similar handling, a blow to Civic owners who thought their car superior in each aspect of performance. The Corolla is generally priced lower than the Civic, as well. However, the Neon beats them both - by a fairly strong margin (nearly 1.5 seconds 0-60 with the base engine) - in acceleration and in handling, and is considerably less expensive to buy, albeit at the cost of resale value. The personalities of the three cars are all different, with the Corolla offering the best ride and the Civic the least pleasant. We think most people would prefer the Corolla, while the performance-minded - who do not want to spend an extra $10,000 on their car after they buy it - will prefer the Neon, especially if they put a Honda "H" over the Dodge logo.